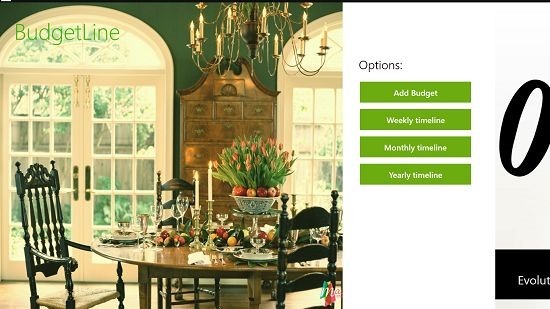 Budget Line is a free app for Windows 8 and 8.1 which allows you to manage and plan your budget on your device. The app has various inbuilt options and tools like monthly, weekly budgets, etc. which allow you to plan for the future with a set amount that you can decide to spend on items which you plan to purchase. In the app’s interface, you will be presented with these options towards the right side of the screen. The app also has certain specialized options which allow you to view the budget timeline graphs etc. wherein you can see exactly where you are going over the budget etc. The added item or items can then also be chosen to be removed via the app’s minimalist control bar which can be brought up by right clicking on the screen. Budget Line is a well designed, and completely functional app which you can grab for free from the Windows App Store. Budget Line will present you with the below shown screen when fired up on your machine. 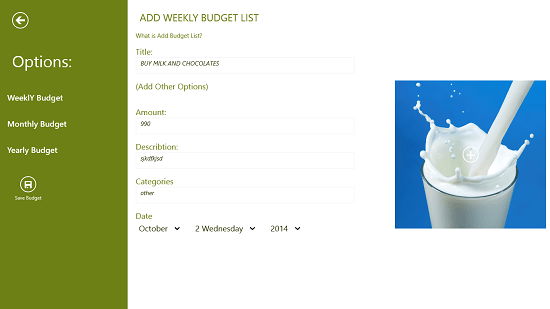 To add or plan a new budget, all you have to do is to click on the Add Budget button at the right side of the screen. When you click on this button, you will be shown the budget creation screen wherein you can choose to plan either weekly budget, monthly budget or Yearly budget. Simply click on the type of budget which you plan to make, and when you click on the respective toggle at the left side of the screen, you will be presented with fields wherein you will be able to enter and set the amount for the various items that you wish to buy. You can also set images for each item by clicking on the plus button on the square box, and as you can already see in the screenshot below, I have added the picture of milk to help me remember that I have to buy milk. Once you have filled in all the fields, go ahead and press the Save Budget button at the bottom of the pane on the left side of the screen. Now if you choose to do so, you can go back to the previous screen, and from here, you can see your budget timeline by clicking on either Weekly Timeline, Monthly Timeline or the Yearly Timeline buttons. In the below screenshot, I chose to click on the Weekly Timeline button. You can see that here you will be able to see the graph of all the planning that you have done, and you can click on budget items on the right to view their graph and detail on the left. From the control bar at the bottom, you can also choose to add budget items, delete the selected budget item, etc. 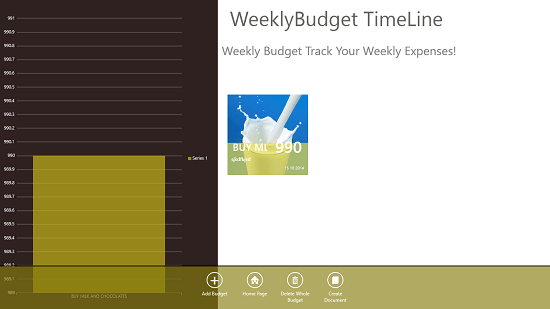 Budget Line is a pretty handy budget planning app for Windows 8 and 8.1. You should definitely check it out as it’s useful for people of all professions, teachers, students, businessmen etc. alike! My rating for this app – 4.5 out of 5!